It's difficult, at first, to get in the right mood for Homecoming, an artfully absorbing government-conspiracy drama starring Julia Roberts and directed by Mr. Robot's visionary creator Sam Esmail, all 10 episodes of which premiere Friday on Amazon. The problem isn't TV-show gridlock (although that's a permanent crisis); it's that real life already happens to be depressingly full of false flags, dirty schemes and disturbing crackpot theories - so much so that the tinfoil-hat crowd is violently acting on its worst impulses, mailing pipe bombs and such. Homecoming doesn't feel like an escape from all that, but setting it aside to enjoy in some saner moment could be an unnecessarily long wait. In one sense, Homecoming is every bit as creepy and demoralizing as the times we live in; as a disciplined work of fiction, however, it also seems safely at a remove from headlines. Think of it as one more reminder that we used to store the crazier ideas in the realm of make-believe. The series is based on a podcast fictional series created by Eli Horowitz and Micah Bloomberg, who've helped Esmail refashion their audio-based narrative (a collage of tense phone conversations and other snippets of recorded evidence) into a terrific, tightly strung tale of deceit and memory, in which a government contractor secretly tests a drug meant to erase the traumatic memories of soldiers, so that the veterans can be recycled back into battle while saving millions on mental health care. Proving once more that the more interesting and decent roles have migrated to television, Roberts gives an impeccably Julia Robertsesque performance as Heidi Bergman, a novice psychologist hired to oversee counseling at a facility benignly branded as Homecoming, a Tampa-based rehabilitation center where soldiers voluntarily partake in programs designed to ease their re-entry into everyday life. During weekly therapy sessions, Heidi grows fond of Walter Cruz (Stephan James), a patient who tells her his worst memories of combat. Each week, Walter seems to forget a little more about that. Walter's buddy, Shrier (Shameless Jeremy Allen White), starts to wig out as the days go by, raving to Walter that the food that the vets are eating in the dining hall is laced with a drug. Esmail makes great use of Homecoming's vibe of paranoia and corporate wrongdoing, along with other techniques that made Mr. Robot such a trip. A parallel narrative, set four years ahead in 2022, indicates that something went wrong at Homecoming and the project was shut down. A low-level Department of Defense investigator, Thomas Carrasco (Boardwalk Empire's Shea Whigham), decides to investigate a complaint made by Walter's mother (Marianne Jean-Baptiste) about her son's treatment at Homecoming. Carrasco is flummoxed by how tight-lipped everyone is, and once he finds her, Heidi doesn't seem to remember anything from her time working at the facility. 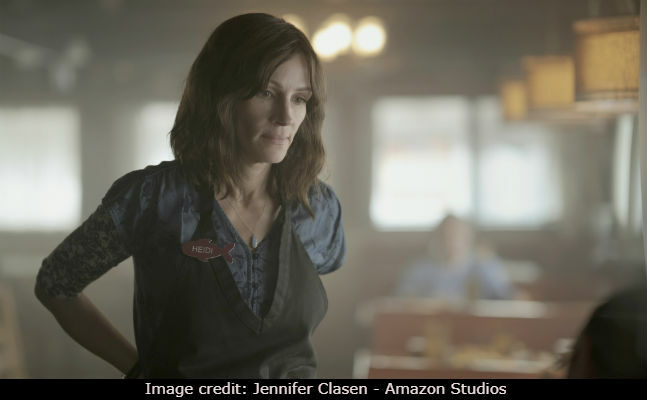 A viewer can distinguish one timeline from the other by the vertically cropped frame of the future scenes and the fact that Heidi now works as a waitress and lives with her mother (Sissy Spacek). Both timelines take place in a homogenous America of shabby surroundings and faded cheer. Drab is where it's at in prestige TV right now - see Forever, Kidding and Maniac for similarly downbeat tones and environs. Future pop-culture theorists may look back and attribute this prevalent blandness to a period-specific malaise, the stylishly arid despair of Trump-era storytelling. In both timelines, Bobby Cannavale (Boardwalk Empire) gives a fine performance as Homecoming's villain, Colin Belfast, an opportunistic corporate striver who sold Homecoming's true objective by browbeating Heidi and her co-workers into carrying it out. As Carrasco's investigation narrows in, Colin sets off to find Heidi and shut her up. Esmail's knack for clever obfuscation is dialed down several notches from Mr. Robot, which means Homecoming's central mystery is rather easy to decipher. The show's curiously banal style is the real draw, from its studiously nondescript surroundings to the borrowed (and sometimes intentionally hackneyed) musical score that summons everything from horror movies to All the President's Men. To all this, add a surprising innovation that a TV critic cannot help but endorse: Homecoming is a half-hour drama (episodes range from about 25 to 35 minutes each, or a five-hour sit for the whole binge), which not only saves precious time for viewers but also, in Esmail's hands, suggests all sorts of new ways to open, close and pace each chapter. Could this be the answer to peak-TV stress disorder? It bears studying.